Intamycin 20 Injection: Each 2 ml ampoule contains Gentamicin USP 20 mg as Gentamicin Sulfate. 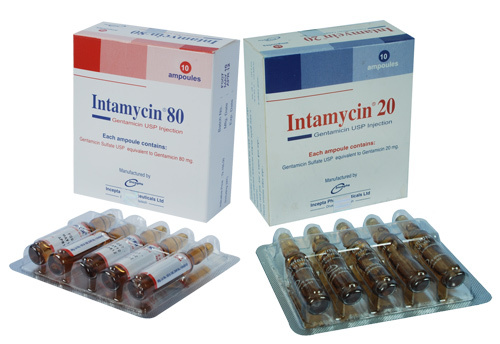 Intamycin 80 Injection: Each 2 ml ampoule contains Gentamicin USP 80 mg as Gentamicin Sulfate. Intamycin injection contains Gentamicin Sulfate USP which is an aminoglycoside antibiotic. Gentamicin is a proven bactericidal antibiotic active against a broad spectrum of Gram-negative pathogens including E. coli, Klebsiella, Proteus spp, Enterobacter, Pseudomonas aeruginosa and Serratia species. It is also active against some Gram-positive organisms (e.g. penicillin & methicillin resistant strains of Staphylococcus aureus). In vitro, Gentamicin is also active against Salmonella and Shigella. Gentamicin interferes with bacterial protein synthesis by binding primarily to the 30S sub-units of bacterial ribosomes in susceptible organisms. Cell death results. Other mechanisms of action may contribute to the bactericidal effect of Gentamicin. Intamycin Injection is indicated in the treatment of serious infections caused by susceptible strains of the microorganisms including: Pseudomonas aeruginosa, Proteus sp, Escherichia coli, Klebsiella, Enterobacter, Serratia and Staphylococcus spp. Intamycin Injection is used for the treatment of the following conditions when caused by susceptible organisms: Septicaemia, Meningitis, Respiratory tract infections, Infected wounds, Skin and skin structure infection, bone and soft tissue infections including peritonitis, septic abortion and burns complicated by sepsis, urinary tract infections. Intamycin is given by the intramuscular route normally. But intravenous administration may be used if required. The dosage is the same for either route of administration. In case of adults, the usual dose is 3-5 mg/kg/day in three divided doses 8 hourly for 7 to 10 days. In patients with impaired renal function, the interval between doses should be increased to 12 hours when the creatinine clearance is 30-70 ml/min, 24 hours for 10-30 ml/min, 48 hours for 5-10 ml/min or may be given as directed by the physician. 2 weeks to 12 years: 2 mg/kg/every 8 hours or as directed by the physician. For I.V. administration, the prescribed dose of Intamycin should be diluted with 100-200 ml sterile normal saline or 5% glucose in water. The concentration of Intamycin in the solution should not exceed 1 mg/ml. Infusion periods of 30 minutes to 2 hours have been advocated. Intamycin Injection should be discarded following a single use. Vestibular damage, reversible nephrotoxicity, auditory ototoxicity may occur. Symptoms are dizziness, vertigo, tinnitus, roaring in the ears, rarely hearing loss. Adverse renal effects may be also caused, more frequently in patients with a history of renal impairment treated with larger doses than recommended. Safety for use in pregnancy and lactation has not been established. Gentamicin crosses the placenta and there is a risk of ototoxicity in the fetus. Gentamicin should only be used where the seriousness of the mother's condition justifies the risk. Small amounts of gentamicin have been detected in breast milk. Therefore it is recommended that breastfeeding be discontinued during therapy unless the expected benefits outweigh any potential risk.